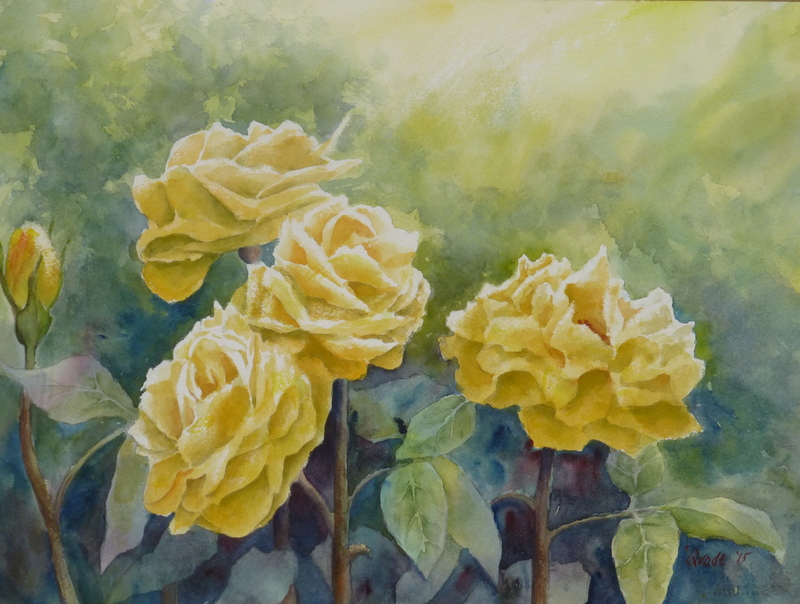 A local painting club has asked me to demonstrate a floral watercolour next week , so I just tried out this painting of roses which I did from three photos. I need to be able to do it in two hours and probably they’ll stop for a cup of tea in the middle so painting time might be reduced to 90 minutes. I like to try it out so I know I can do it in the time. I will use more lemon yellow next time for the flowers and rearrange the leaves a little so I get a better feeling of depth. I was once asked to paint a landscape for a Rotary Club meeting. Near to the day of the meet the man who arranged it let slip that they gave about 20 minutes for the talk. I then pared down the demo and on the day did the painting in 19 minutes and they seemed to like the result! Meagre pickings today. I had to do another watercolour flower demo and thought that some roses might be worth trying. I had seen these climbing roses in France the other week and had a notion to try them. I really wanted to get some loose forms coming down the frame ending with perhaps one which was more defined, but was aware that following the demo I will be running a workshop next week when the class have a try, so I needed to approach it more formally and methodically. Well here it is, but in doing it, I also realised that it might be too much for the less experienced – I certainly had a tussle with it. So back to the drawing board. Instead I went for the old fallback, the hellebores. Well, in the end all I want is to build confidence in loose washes and mixing on the paper. So here was what I did this morning as the demoo piece. It will be interesting to see what the class produce next week. A third painting for the upcoming exhibition in the garden centre. I got it completed in time to take in today. The exhibition seems a bit chaotic, but it will be interesting to see how it goes. Generally first exhibitions do well as you can be tapping into a new market, but after a few repetitions those that buy have no more room in their walls. I need to go up and see how another exhibition near Preston is going. I entered a few years ago on their inaugural event and sold a couple of paintings, but now after at least five years, I am not holding out much hope. The exhibitions are coming thick and fast. I also have three painting down in Liverpool, which coincides with a festival they are having. The venue is a little out of the way and the theme was the Mersey which rather restricted what I could enter. Still, I was able to dig three out the archives.